Reduced games are chess games in which each side has significantly reduced material, usually with one side having little to no material. They are important in determining optimal play, as they allow calculations to proceed along the lines of backwards induction. Progressively more complicated positions can be evaluated by reducing them to known endgames. In particular, it is especially useful to know what sets of pieces can checkmate a lone enemy king, and how to play optimally in those situations. Unfortunately, in all but the simplest cases, this is quite a difficult task, and the evaluation will often depend on the placement of the pieces rather than just their relative value. The simplest endgame to analyze occurs when one side has an uncontested queen. As the queen is the strongest piece in the game, it seems likely that this endgame can be won by the stronger side, and indeed this is generally true. Move the queen to a square one knight's move away from the opposing king (i.e. two squares in any of the four cardinal directions, and one square in either direction perpendicular to that). If multiple are possible, choose any, but the one that results in the smallest box (see below) is optimal. On every subsequent move, "copy" the opposing king move with the queen; for example, if the opposing king moves one square up, the stronger side moves the queen one square up. However, if the opposing king moves to the corner, do not copy the move (as this would be stalemate). Instead, move the queen three squares in either direction away from the opposing king, and one square in the direction perpendicular to that. Move the king to a square two squares opposite the corner the opposing king occupies. Deliver checkmate by moving the queen to the appropriate square. There is one potential caveat, when the stronger side's king blocks the path of his queen. In this case, the simplest procedure is to simply move the king out of the way, and then reapply the above algorithm. It is relatively easy to show that this algorithm works, by defining the box of a queen's position to be the area of the rectangle the opposing king is in, when lines parallel to the sides of the board are drawn through the queen. At all but a finite number of steps, the box of the queen's position decreases, until it eventually decreases down to 3. At this point, the opposing king has only two legal squares (a corner and a square adjacent to the corner), so the opponent's only legal moves are to move back and forth between the two squares. The stronger side's king is then brought into the game, and checkmate ensues quickly. 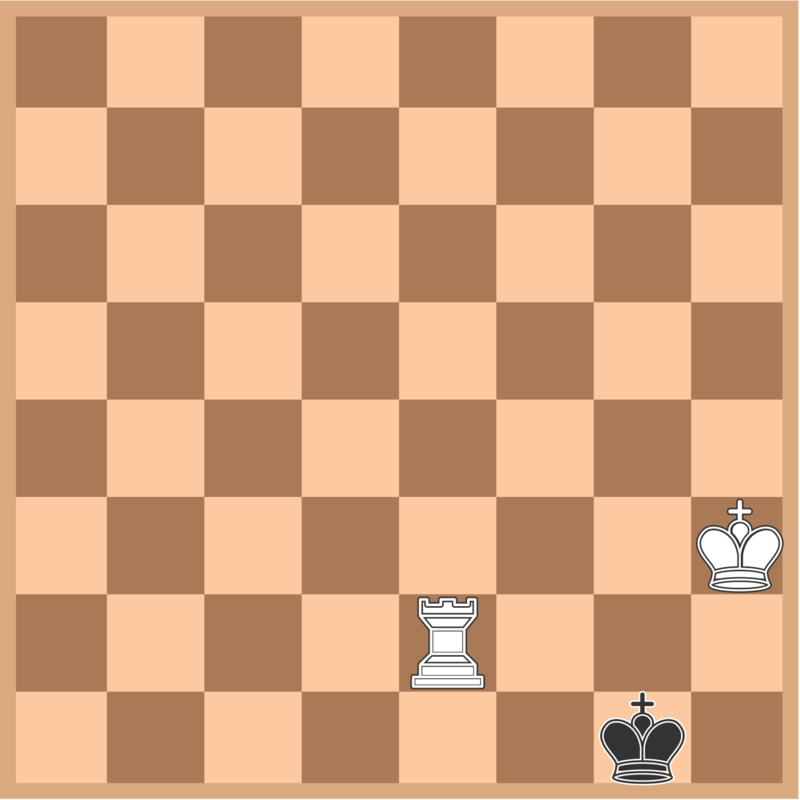 Note that the algorithm does not give the fastest possible checkmate; indeed, in the above demonstration, checkmate could have been given two moves earlier (with the white king still on f3). But it is valuable because it is easy to execute and guarantees an eventual checkmate. In the following position, which of the following moves is strongest (using the algorithm from above)? The next natural question to ask is whether a rook is a sufficient advantage to checkmate the opponent, and here the answer is also affirmative. The algorithm, however, is far more complicated. Again, the general strategy is to utilize the "box" method, restricting the opposing king's possible movements as much as possible. However, this is made more complicated by the fact that the opposing king can attack the rook, meaning that the rook is unable to push the opposing king back on its own. Instead, the stronger side must use his king to aid in the process. If the rook can be moved diagonally across from the opposing king (in a way that reduces the size of the box) without being captured, do so. 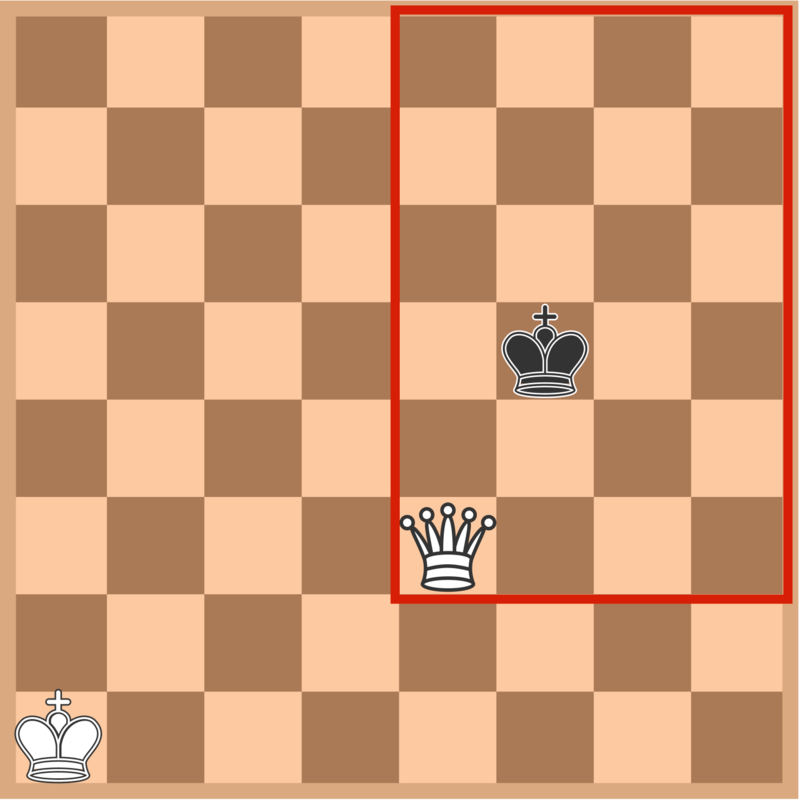 Otherwise, move the king towards the opposing king so that 1 will be possible. However, this poses a problem: what to do in the case of a position such as the one below? which will force the opposing king to move suboptimally: if it moves to the right, white responds by giving check with the rook, then repeating the process. 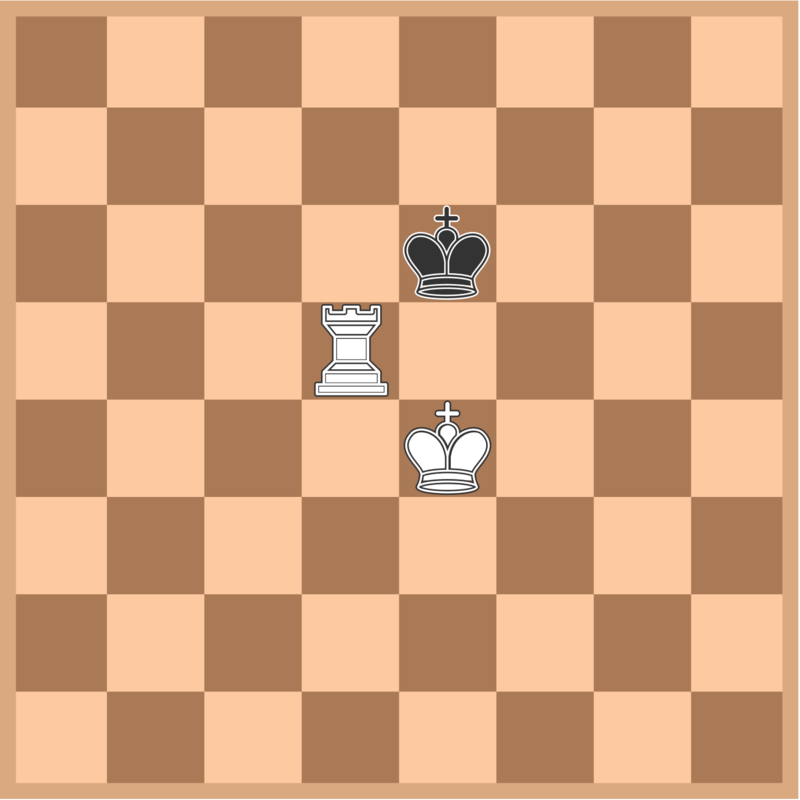 If it moves somewhere else, White can follow with the king, thus further restricting black's movement. At any point, if the rook is more than one rank (or file) away from the opposing king, move the rook to be one rank (or file) away if doing so would not result in being capured. If possible without being captured, move the rook diagonally across from Black's king. 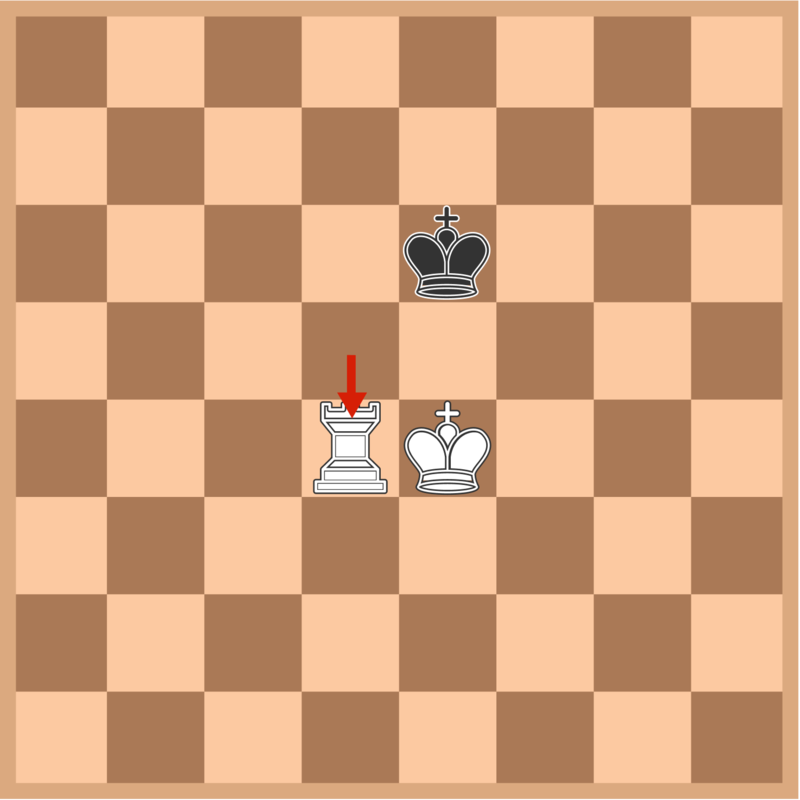 Otherwise, move the king so that (1) is possible. If (1) is impossible and the king is already optimally placed, make a "waiting move" with the rook, thus forcing Black to move his king suboptimally. This move may be a check, as in the case above where Black moves to the right. When the opposing king is in the corner of the board, the aforementioned check will in fact be checkmate. Note the implicit use of Zugzwang in this algorithm, forcing Black to make a move when he would rather simply pass his turn. As before, this does not give the fastest possible checkmate, but it works reliably and is easy to execute. Find the minimum number of moves for White to checkmate Black. White starts, and Black plays optimally. The next natural question to ask is whether a minor piece (bishop and knight) is sufficient to checkmate the opponent. Here, the answer is no; in fact, there is no way to give checkmate at all, even if the opponent cooperates! The best the stronger player can achieve is stalemate, and so the logical conclusion of the game would be a draw. However, a pawn is sometimes enough material to win, as it can be promoted into a queen or a rook, with the above algorithms then taking effect. This is an excellent example of the importance of reduced games: by knowing offhand that king+queen vs. king can be won (and how to win it! ), it can also be established that if a position where the pawn safely promotes can be reached by force, then the original position must have been winning as well. King and two knights vs. King: This position is generally a draw, unless the opposing king is particularly poorly placed. Interestingly, a king and two knights can often defeat a king and a pawn, but not a lone king! King, Rook, and Pawn vs. King and Rook: This situation is extremely common in practical play, and depends on a number of factors including the positions of the king. As a rule of thumb, if the opposing king is in front of the pawn, the position is likely drawn; if the opposing king cannot reach the front of the pawn, the position is likely won. King and Pawn vs. King: This situation is also quite common in practical play, and depends on the positions of the kings as well as how advanced the pawn is. Both sides would prefer to have their kings in front of the pawn; as a rule of thumb, if the stronger side manages to place his king two ranks ahead of the pawn, the position is winning, and if this is impossible then the position is likely drawn. White to move. What is the least number of moves for white to checkmate the black king? Assume both sides play optimally. If you think that checkmate is not possible, input your answer as \(0\).